The Huami and Amazfit brands aren’t household names, but they’re very well-known among people who have done some research when looking for a smartwatch. 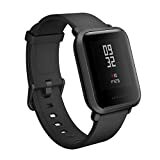 The Amazfit Bip by Huami features a beautiful display, all-day heart rate tracking, sleep tracking, iPhone and Android compatibility, and a shockingly affordable price tag. Most incredibly though, it has battery life of up to 30 days on a single charge. 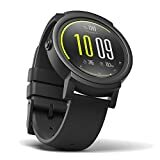 The Ticwatch E is perfect for anyone looking for a no-fuss smartwatch with a great design and all the basic features you might want. It runs Android Wear 2.0 so there are also plenty of apps available once it comes time to expand its functionality. It’s also packed full of fitness tracking features, so it’s a great companion to have while you work out or go for a run. Fitbit has become a household name in recent years. The company cemented its position as the premiere brand in fitness tracking, but it has moved beyond just tracking bands. 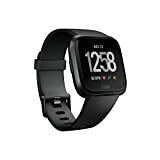 Fitbit is now also one of the biggest names in smartwatches, and the Fitbit Versa is the best model yet. The Versa’s specialty is all things exercise, of course, but it also pairs with any iPhone or Android phone to handle things like notifications, texts, and more. Huawei Watch. This sleek smartwatch is perfect for people who want smart features in a design that looks like a traditional time piece. Ticwatch S. This Android Wear 2.0 smartwatch is powerful yet slim and sleek, making it perfect for people who don’t want a bulky watch. GUESS Men’s Stainless Steel Touchscreen Watch. The stainless steel bracelet and strong design make this a great option for those who only want basic smartwatch features. Samsung Gear S3 Frontier Smartwatch. This model obviously goes great with Samsung smartphones and it’s packed full of features. Samsung Galaxy Watch. The latest and greatest from Samsung, offering days-long battery life and excellent integration with any Android phone.